As a former college athlete, health and physical fitness were always important to Mitch McLeish. Hailing from a solid basketball background at Ryle High School and then Cincinnati Christian University, McLeish was always on top of his game both mentally and physically. Now, he’s turned that passion for sports and fitness into a new career path. A franchise stemming from Nashville, I Love Juice Bar is the newest business to hit Beechmont Avenue in Anderson, and according to McLeish, this was the perfect opportunity for him to bring his business management and athletic background to the community. 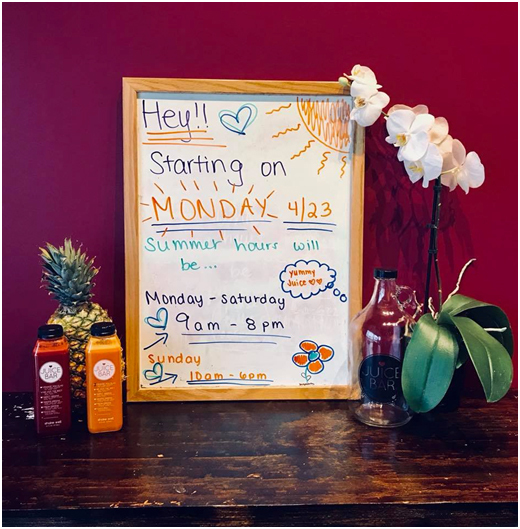 This combination of nutrition and exercise became the drive behind McLeish’s I Love Juice Bar, which celebrated its grand opening on April 6th. The juice bar offers a menu featuring mostly gluten-free and organic options, using fruits and vegetables to blend juices from scratch. The menu holds a mix of options for every appetite. With a variety of “greens” and “roots” juices; fruit, veggie and protein smoothies; acai bowls; essential oils, monster, and power blended shots; and a variety of wraps, sandwiches, and bowls, I Love Juice Bar caters not only to those seeking a juice reset or snack but also people wanting something quick, easy, and on-the-go. Located in Anderson Towne Centre across from Crunch Fitness and Sky Zone Trampoline Park, McLeish saw this as the perfect place to incorporate his business. It’s currently the only location in Ohio, according to the franchise website. McLeish also said he hopes to open two more stores in Northern Kentucky in the Union and Florence areas in the near future. But for now, his focus is bringing his knowledge and passion to the Anderson location. The 1,000-square-foot juice, smoothie and wellness shop I Love Juice Bar is located at 7504 Beechmont Avenue in Anderson and is open Monday through Saturday 9 a.m. to 8 p.m. and Sunday 10 a.m. to 6 p.m. You can follow Mitch McLeish and his business venture with I Love Juice Bar on Facebook, Twitter, and Instagram @juicebaranderson.